This past weekend I had the pleasure of volunteering to help bottle over at Big Bottom Whiskey in Hillsboro, Or. In just about 2 hours time, 6 of us had 58 cases of bourbon bottles stickered, filled, corked, capped, and boxed. Not too shabby, considering two of us had zero prior experience. Ted, the owner and all around great guy, placed me at the corking station while Jean held down the ‘capsule’ station placing the shrink-wrap tops on the bottles after I corked them. I won’t lie, manually corking bourbon bottles takes a toll on your hands. The whole crew really rocked it: Ted’s wife Taylor took the heat shrink station, Aaron took the filling station while Ted prepped the bottles for filling and Liz ran double duty placing the stickers and helping Taylor load the bottles into the cases. For such a small crew, I have to say we were efficient and effective in knocking out nearly a full palette’s worth of whiskey! 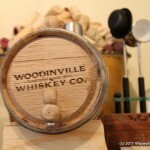 The day was productive and it was great to be able to help a small local business and local whiskey guy. Supporting the community of producers is important to me as there aren’t many people focused on whiskey and without support no one in the community can grow. But beyond lending my support to what Big Bottom is doing, it was really just fun to spend a few hours with people who are truly passionate about the industry, have decided opinions, and love talking shop. Being able to spend time talking about whiskies, comparing notes, learning about the business side of things, and just learning more about whiskies in general was truly the highlight for me. Even better was the fact that Ted asked me to return at a later date for some more in depth tastings than the two we got to after our work was done on Saturday. We had some small tastes of the 3 yr bourbon which we had just bottled up, as well as the 2 yr port finish which had been on the wood for 7 months… spectacular! (I’m telling you again, if you can find the port finish buy it all, and then buy it again when the next batch comes out! You won’t be disappointed.) I am really looking forward to seeing what this next port finish batch produces. If the 7 month taste was any indication, it will be even more subtle yet complex than the first batch Big Bottom bottled up. Good stuff is on the horizon! I even got some good advice from Ted which I was able to immediately implement when I returned home on Saturday…. but we’ll get to that in a moment. 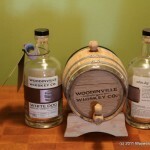 It seems that every blog thus far in which I have spoken of Big Bottom Whiskey also includes mention of Woodinville Whiskey Co. and I can’t help but find that amusing if not wholly coincidental. 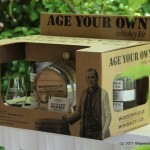 This case is no different, as Sunday I put their “Age your own whiskey” kit to (hopefully) use. Well, maybe that is a slight misdirection, as I really started the process the prior Thursday…. While I waited, I took a longer gander at the kit, which includes not only the cask and two 750ml bottles of White Dog, but 2 tulip style nosing/tasting glasses, and of course a funnel to fill the cask. Since the cask is only about 2 liters large, the funnel is rather small in order to easily fill it. Imagine the same sized funnel you’d use to fill a flask and you’ve got the right idea here. The kit is actually really well put together and the included instructions are very well written; clear, concise, easy to understand explaining some of the “whys” not just the “whats”. Oh…. um. Well I hadn’t really thought of letting it rest as I didn’t want to run the risk of the cask drying and re-introducing leaks. And here is where Ted’s advice came in to play: “Let it rest/dry for 24 hours, otherwise you’re going to introduce too much water into the whiskey.” You know it seems perfectly obvious now, but I hadn’t even thought of that until he’d mentioned it. And with our Oregon humidity, I don’t really run any risk of the cask over-drying in 24 hours. So, once we’d finished bottling and returned home, I dumped the water from the cask noting there had been no leaks past the first five minutes after I’d filled it (and kept it filled for the next two days). And then I just let it rest until Sunday. That was a very long 24 hours. 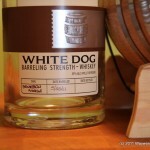 Perhaps I’m not the best person to try his (novelty) hand at aging whiskies after all… Sunday came, and I popped open the two bottles of White Dog. Luckily I was thinking while pouring and stopped after the first bottle so I could have a quick taste of the unaged spirit I was about to play with. Nose: Mild caramel sweetness. Heavier vegetation sweetness. Retains the smell of the mash even after distillation. Palate: Heavy vegetation sweetness. Slight bitterness of the corn/rye mash comes through. Surprisingly heavy note of Anise. Finish: Almost floral in tone. Light and clean, but very hot at 110 proof. The cask itself holds about 2.5 bottles (750ml each), so there was a little ‘head room’ in the cask when I was done filling it. I replaced the bung, and set the cask in my pantry, atop my wine fridge where it sits just waiting. I do expect to lose some ‘angels share’, possibly a tad more due to not a complete fill of the cask. All told I figure I’ll likely get one full 750ml bottle, and a second 500ml fill from the two bottles I added to the cask. And now the waiting really begins. 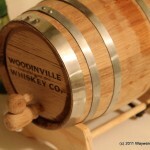 Luckily for me, the smaller cask size actually accelerates the aging process due to larger surface area contact with the wood. The small 2 liter cask size roughly translates into an aging factor of 53 times faster than a normal sized cask. 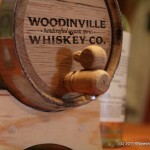 Because of this, the cask should begin imparting flavour and nose qualities within the first week of aging. Each week nearly acting like a relative year in a larger cask by my estimation. So, as you’d expect, I’ll be having a small taste every week and writing down my notes to contrast from the beginning distillate to the present week. I’m not sure when I’ll stop and rebottle, but I figure it will likely be after 3 weeks of no discernible change in flavour. That may come early in the process, or possibly months to a year from now, we shall see.